The S70 1911 Classic Commander Hammer is a reproduction of the hammer that Colt ? installed in the pre Series 80 ? commander pistols. This will allow those who are restoring their pistols to replace their aftermarket hammer with a correct reproduction. 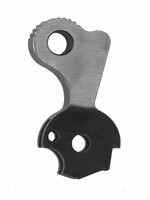 The S70 1911 Classic Commander Hammer is heat treated through out to 50-54 RC for maximum wear resistance. Each hammer is tested on our certified Rockwell hardness tester and provided with a test certificate. Suitable for all applications with beavertail grip safeties and standard 1911 government grip safeties notched for commander hammers.